What Paracord is Right for Me? Do you ever wonder what paracord would be right for a bracelet, a gun sling, necklace, or for survivalists? Here is your guide! 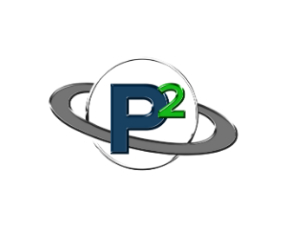 Update: since the time this post was written, we have added new kinds of paracord. Please see our Cord Comparison Chart for more current information. 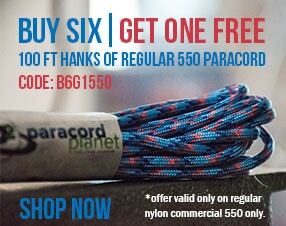 The use of 550 cord in the military as literal Parachute cord has launched the 550 style into the mainstream market. We have witnessed everything from 550 Paracord dog collars and 550 Paracord bracelets, to Paracord dolls and fishing lures. Our certified type III Paracord supports up to 550 Pounds and will be there when you need it most. Our smooth as butter nylon string will fit comfortably on your wrist or over your shoulder as a Paracord rifle sling. Don’t worry about finding the right color of Paracord either, we offer the worlds largest selection of 550 paracord and our stock is always growing! Our 425 cord is just as great as our 550 cord but just a little smaller and will hold up to 425 pounds, do we see a pattern here? This makes it ideal for a thinner Paracord bracelet that still will be up for the task in most any survival situation. One of our most popular uses for the 425 cord have been for a Paracord shoe lace, these laces will not only look awesome on your camo boot, but is also easily unstrung for any fishing emergency. We offer over 100 of the best colors of 425 paracord that we know you’ll love and use even more than you think. Our 275 Paracord holds up to, you guessed it, 275 pounds and is just a little thinner yet. The thinner nylon core will make for a perfect Paracord bracelet for the children so they can look just like mom and dad. Can’t you just picture your little ones with their mini Paracord rifle sling shooting at pop cans around the yard? With over 60 color variations, our 275 cord is our most versatile cord that will stand up to the biggest tasks. It is easily carried or incorporated in your adventures and easily shines in the toughest of situations. That’s right, we have it. Paracord Planet is proud to present Titanium Paracord. This 550 Paracord is officially licensed as Military Grade cord that is our top notch Paracord normally used exclusively by the military. 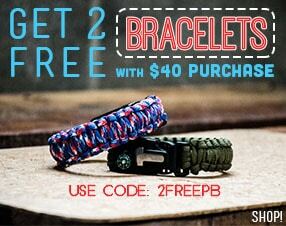 This is no longer the case as you are able to buy this military grade Paracord today! With over 10 colors to choose from, get your hands on some MIL-C-5040 today! Our nylon material Micro Paracord has break strength of 100 pounds and goes great by itself and also with our 550 cord for a little added color for any woven Paracord patterns, whether it’s a Paracord bracelet, lanyard, rifle sling, or Paracord dog collar. Sure to fit your needs, when it comes to a versatile Paracord string that will stand up to the test. One of our favorite uses for the Micro Paracord has been for a Paracord necklace. This necklace can be woven to make patterns or to simply replace a necklace chain to make a more comfortable Paracord alternative. Try to find your favorite micro paracord color- we have reflective micro cord and glow in the dark (perfect for Halloween)! Nano Paracord is our smallest Paracord but it definitely has no shortage of great uses. Its break strength is 36 pounds which amazingly will still get the job done in any situation. Some great uses we have for our Nano Paracord is for the all important traps being set for game in the wild, or even just to catch that rabbit that has been eating all your carrots in the garden. Being our thinnest Paracord, you are able to bring a lot of it in a small amount of space. 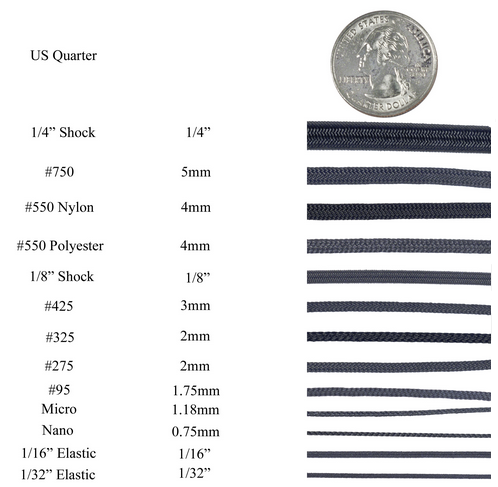 Don’t be afraid to order for all your Nano Paracord needs. As always, if you have any further questions please find us on Facebook, Twitter, Instagram, Pinterest, or Google+.